It has been a week past......time flys. Star Wars Celebration6 was awesome!! It was a place of my dream comes true. 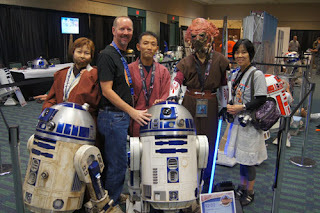 This is the pic of when we visited the room of R2-D2 builders. 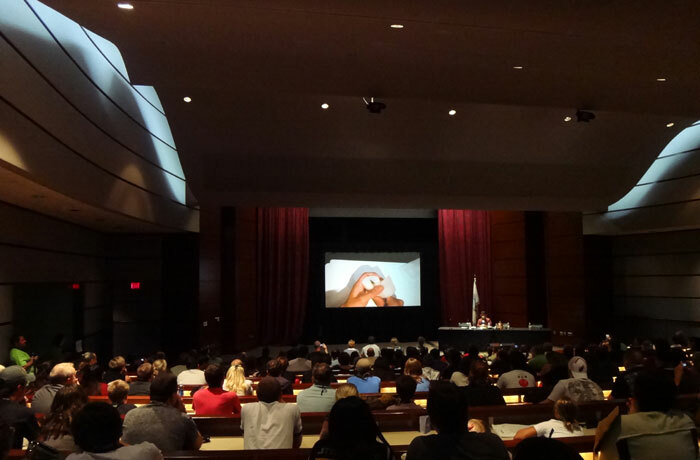 this beautiful room of Star Wars University at the 1st day. 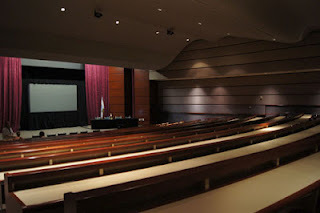 get in because there are noe seats left! Actually, I found one person in the front line just before I started. His name is Mike... the writer of the Force.net. We have known each other for a long long time. it was a very happy moment!! Then I started the class. 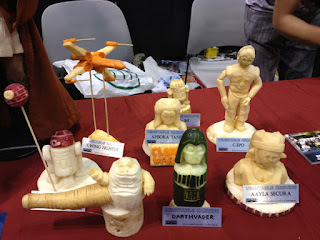 vegetable carving which I made in past..
Then did the demonstration of how to carve the R5 &R4. People (the audience) were just great...They were wonderful!! I will never forget about that day. Thank you so much for being there....thanks a billion! we were 4 of us(Jedi Order Japan) went together to run the booth. 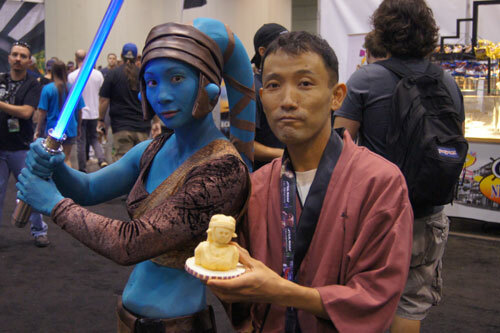 We show how we enjoy the Star Wars in Japan. Here is the pic of us with Mr .John Morton in our booth! they won the first and 3rd prize.....Great! They do also very nice move of the Jedi Arts. 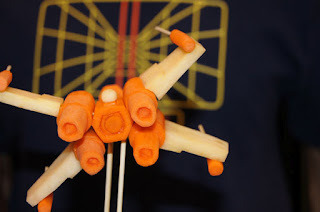 Speaking of carving....I made 11th StarWars vegetable carving during 4days. It was a real meeting of the most advanced digital technology and old Japanese food art. After I arrived in orlando, I went to the supermarket by taxi. then I realize that vegetable were totally different than I use in Japan! Therefore I bought which I seemed to be able to use the vegetables. after all, rutabagas and Parsnips were my favorite. 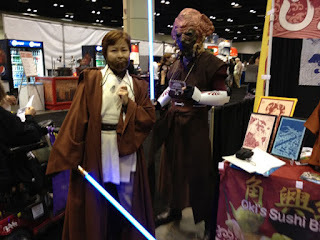 Here are the Jedis..made by rutabagas. 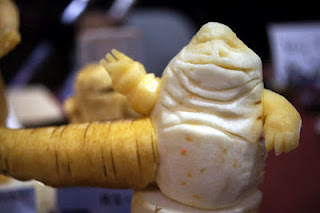 I used Parsnip skin for Jabbas body and I quit like it. 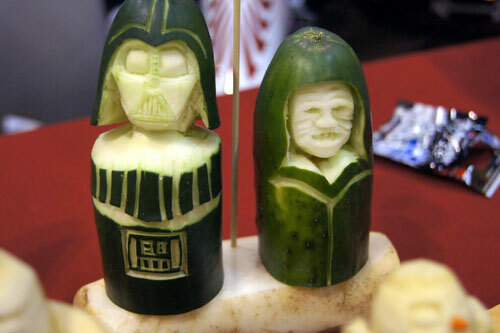 it was easy to carve the Vader and sidious. If I could use bigger refrigerator near my booth, I could make more bigger ones. 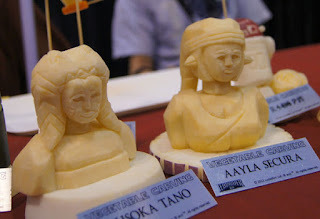 That is why I prefer to make small carvings than big one. There were very many people visited our booth. I'ld like to say thanks for coming...I miss them all ! 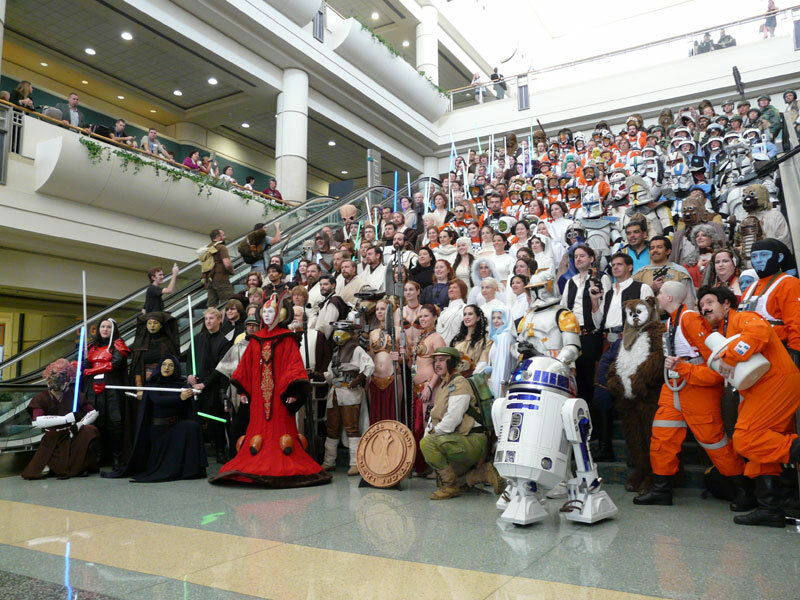 There was one thing I missed..... the group photo of the Rebel Legion! I'm a member of the Rebel since 1995. 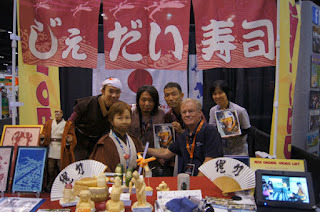 But I'm proud of what I was doing..
We were very honored to meet you at Celebration VI. You do wonderful work. You probably will not remember me but I was the lady in the wheelchair that took very close pictures of your carvings. I have not downloaded them yet but if they turned out good I will send them to you on Face Book. Since I cannot walk much I do many things with my hands. I especially enjoy painting, but you have shown me something new to try. I have already purchased the cutting tools you showed us in your class. My daughter-in-law works at a sushi restaurant here in the states. She is going to see if they can make a sushi roll like the one in your pictures that spells Star Wars. I am hoping to learn to carve Star Wars figures and make them to go with the sushi for my son's 16th birthday next month. 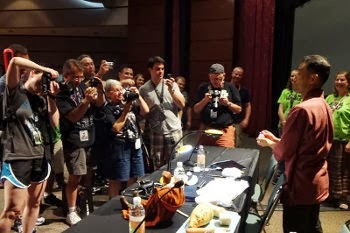 He is a huge help to me, a huge Star Wars fan and he really enjoyed your class and art. Thank you so much for traveling such a long distance to share your art at the Celebration. It is always exciting to learn and try new things. Thank you. 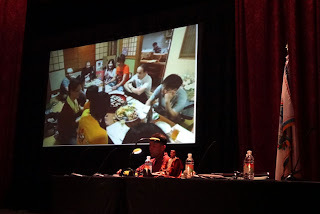 It was thank you so much for visiting my Panel and booth. Also I appreciate you left me a great message. Please let her know about my blog and hopefully she can find some idea from here. The carving may seems difficult at first sight, but if you do step by step..not too difficult! I suggest making R5 few times and get use to feel the vegetables. I'm looking forward to see your page of facebook.